"Eben-Emael" redirects here. For the village of Eben-Emael in the municipality of Bassenge, see Bassenge. 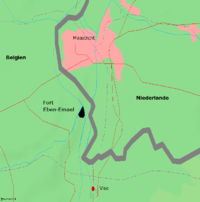 Fort Eben-Emael (French: Fort d'Ében-Émael) is an inactive Belgian fortress located between Liège and Maastricht, on the Belgian-Dutch border, near the Albert Canal. It was designed to defend Belgium from a German attack across the narrow belt of Dutch territory in the region. Constructed in 1931–1935, it was reputed to be impregnable and at the time, the largest in the world. The fort was neutralized by glider-borne German troops (85 men) on 10 May 1940 during the Second World War. The action cleared the way for German ground forces to enter Belgium, unhindered by fire from Eben-Emael. Still the property of the Belgian Army, the fort has been preserved and may be visited. "Maastricht 2" one of Fort Eben-Emael's casemates. 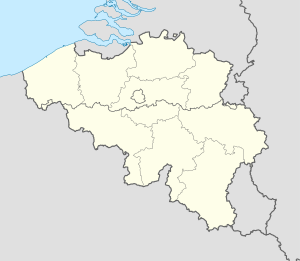 The fort is located along the Albert Canal where it runs through a deep cutting at the junction of the Belgian, Dutch and German borders, about 20 kilometres (12 mi) northeast of Liège and about 10 kilometres (6.2 mi) south of Maastricht. A huge excavation project was carried out in the 1920s to create the Caster cutting through Mount Saint Peter to keep the canal in Belgian territory. This created a natural defensive barrier that was augmented by the fort, at a location that had been recommended by Brialmont in the 19th century. Eben-Emael was the largest of four forts built in the 1930s as the Fortified Position of Liège I (Position Fortifiée de Liège I (PFL I)). From north to south, the new forts were Eben-Emael, Fort d'Aubin-Neufchâteau, Fort de Battice and Fort de Tancrémont. Tancrémont and Aubin-Neufchâteau are smaller than Eben-Emael and Battice. Several of the 19th century forts designed by General Henri Alexis Brialmont that encircled Liège were reconstructed and designated PFL II. A great deal of the fort's excavation work was carried out on the canal side, sheltered from view and a convenient location to load excavated spoil into barges to be taken away economically. The fort's elevation above the canal also allowed for efficient interior drainage, making Eben-Emael drier than many of its sister fortifications. Fort Eben-Emael was a greatly enlarged development of the original Belgian defence works designed by General Henri Alexis Brialmont before World War I. Even in its larger form, the fort comprised a relatively compact ensemble of gun turrets and observation posts, surrounded by a defended ditch. This was in contrast with French thinking for the contemporary Maginot Line fortifications, which were based on the dispersed fort palmé concept, with no clearly defined perimeter, a lesson learned from the experiences of French and Belgian forts in World War I. The new Belgian forts, while more conservative in design than the French ouvrages, included several new features as a result of World War I experience. The gun turrets were less closely grouped. Reinforced concrete was used in place of plain mass concrete, and its placement was done with greater care to avoid weak joints between pours. Ventilation was greatly improved, magazines were deeply buried and protected, and sanitary facilities and general living arrangements for the troops were given careful attention. Eben-Emael and Battice featured 120mm and 75mm guns, giving the fort the ability to bombard targets across a wide area of the eastern Liège region. Fort Eben-Emael occupies a large hill just to the east of Eben-Emael village (now part of Bassenge) and bordering the Albert Canal. The irregularly-shaped fort is about 600 metres (2,000 ft) in the east-west dimension, and about 750 metres (2,460 ft) in the north-south dimension. It was more heavily armed than any other in the PFL I. In contrast to the other forts whose main weapons were in turrets, Eben-Emael's main weapons were divided between turrets and casemates. The 60mm, 75mm and 120mm guns were made by the Fonderie Royale des Canons de Belgique (F.R.C.) in the city of Liege. Block B.I - entrance block with two 60mm anti-tank guns (F.R.C Modèle 1936) and machine guns. Blocks B.II, B.IV and B.VI - flanking casemates located around the perimeter ditch to take the ditch in enfilade with two 60mm guns and machine guns. Block B.V - similar to II, IV and VI, with one 60mm gun. Cupola 120 - one twin 120mm gun (F.R.C Modèle 1931) turret, with a range of 17,5 km. There were also three dummy 120mm turrets. Cupola Nord and Cupola Sud - each had one retractable turret with two 75mm guns (F.R.C Modèle 1935), with a range of 10,5 km. Visé I and IÍ - each house three 75mm guns, facing south. Maastricht I and II - each house three 75mm guns, firing north in the direction of Maastricht. Canal Nord and Sud - were twinned blocks housing 60mm guns and machine guns covering the canal. 'Sud' was demolished when the canal was enlarged. 'Mi-Nord and Sud' are machine gun blocks (mitrailleuses) in the main surface of the fort. They were crucial in defending the top of the fort. 'Block O1' overlooks the canal and guarded the Lanaye locks. It housed a 60mm gun and machine guns. Underground galleries extend over 4 kilometres (2.5 mi) beneath the hill, connecting the combat blocks and serving the underground barracks, power plant, ammunition magazines and other spaces. Fresh air was obtained from intake vents over the canal. In 1940, Fort Eben-Emael was commanded by Major Jottrand. There were around 1,200 Belgian troops stationed at the fort, divided into three groups. The first group was permanently stationed at the fort and consisted of 200 technical personnel (e.g. doctors, cooks, weapon maintenance technicians, administration staff). The two other groups consisted of 500 artillerists each. In peace time, one group would be stationed at the fort for one week, and the other group would be in reserve at the village of Wonck, about 5 km (3 mi) away. These two groups would change places every week. Except for some of the officers and NCOs, most of the men were conscripts. The majority of these were reservists and were called up after the Invasion of Poland in 1939. Infantry training was poor, since the men were considered to be purely artillerists. On 10 May 1940, 78 paratroopers of the German 7th Flieger (later 1st Fallschirmjäger Division) landed on the fortress with DFS 230 gliders, armed with special high explosives to attack the fortress and its guns. Most of the fort's defenses were lightly manned and taken by complete surprise. Much of the fort's defensive armament was destroyed in a few minutes. The attackers were unable to penetrate inside the underground galleries, but the garrison was unable to dislodge them from the surface of the fort. The fortress surrendered one day later, when the paratroopers were reinforced by the German 151st Infantry Regiment. While 1,200 soldiers were authorized to be at the fort on any given day, only 650 were there, with an additional 233 troops six km away at the time of the German assault. Good espionage and superior planning, combined with unpreparedness on the Belgian side, helped make the execution of Hitler's top secret plan a swift and overwhelming success. The capture of Eben-Emael involved the first utilization of gliders for the initial attack and the first use of hollow charge devices in war. The gliders, led by First Lieutenant Rudolf Witzig, landed on the roof of the fortress and being totally silent, took the defenders by complete surprise. They were able to use the hollow charges to destroy or disable the gun cupolas. They also used a flamethrower against machine guns. The Belgians did destroy one of the key bridges, preventing it from being used by the Germans but also preventing a relieving force from aiding the fortress. The Germans lost only six of the assaulting engineers and had 21 wounded, keeping all the defenders pinned down until the arrival of the main attacking army. After the extraordinary success in the capture of the fort, Hitler personally decorated all the participants of the assault. 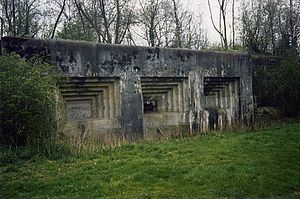 Eben Emael, considered the strongest fortress in the world, was the linchpin of the Belgian main line of defense and dominated all terrestrial communications around the Albert Canal. It was a sensational coup and its loss delivered a hard blow from which the Belgian Army could not recover. Fort Eben-Emael is now open to the public. While still military property, it is administered by the Association Fort Eben-Emael, which provides tours and activities. ^ "The Capture of Fort Eben - History Learning Site". Retrieved 14 November 2018. ^ a b Dunstan, Simon (2005). Fort Eben Emael: The Key to Hitler's Victory in the West. Osprey. p. 12. ISBN 1-84176-821-9. ^ a b c Kauffmann, J.E. (1999). Fortress Europe: European Fortifications of World War II. Combined Publishing. p. 103. ISBN 1-58097-000-1. ^ Puelinckx, Jean. "Eben-Emael - Sous-sol". Index des fortifications belges (in French). fortiff.be. ^ Mary, Jean-Yves; Hohnadel, Alain; Sicard, Jacques (2001). Hommes et Ouvrages de la Ligne Maginot, Tome 1 (in French). Histoire & Collections. pp. 17–19. ISBN 2-908182-88-2. ^ Donnell, Clayton (2007). The Forts of the Meuse in World War I. Osprey. pp. 55–56. ISBN 978-1-84603-114-4. ^ Puelinckx, Jean. "Eben-Emael - Bloc I - Entrée". Index des fortifications belges (in French). fortiff.be. ^ Puelinckx, Jean. "Eben-Emael - Coupole 120". Index des fortifications belges (in French). fortiff.be. ^ Puelinckx, Jean. "Eben-Emael - Coupole Nord". Index des fortifications belges (in French). fortiff.be. ^ Puelinckx, Jean. "Eben-Emael - Coupole Sud". Index des fortifications belges (in French). fortiff.be. ^ Puelinckx, Jean. "Eben-Emael - Visé I". Index des fortifications belges (in French). fortiff.be. ^ a b Puelinckx, Jean. "Eben-Emael -Visé II". Index des fortifications belges (in French). fortiff.be. ^ Puelinckx, Jean. "Eben-Emael -Visé II". Index des fortifications belges (in French). fortiff.be. ^ Puelinckx, Jean. "Eben-Emael - Canal Nord". Index des fortifications belges (in French). fortiff.be. ^ Puelinckx, Jean. "Eben-Emael -Canal Sud". Index des fortifications belges (in French). fortiff.be. ^ Puelinckx, Jean. "Eben-Emael - Mi Nord". Index des fortifications belges (in French). fortiff.be. ^ Puelinckx, Jean. "Eben-Emael -Mi Sud". Index des fortifications belges (in French). fortiff.be. ^ Puelinckx, Jean. "Eben-Emael -O 1 Observatoire". Index des fortifications belges (in French). fortiff.be. ^ Puelinckx, Jean. "Organigramme 1940". Index des fortifications belges (in French). fortiff.be. ^ "Military History Online". www.militaryhistoryonline.com. Retrieved 14 November 2018. ^ zxwar (13 December 2007). "The Fall Of Fort Eben Emael (Part 1/5)". Retrieved 14 November 2018 – via YouTube. ^ "Home". Fortissimus Eben-Emael. ASBL Fort Eben-Emael. Archived from the original on 10 August 2010. Retrieved 27 October 2010. Dunstan, Simon (2005). Fort Eben-Emael: The key to Hitler's Victory in the West. Osprey. ISBN 1-84176-821-9. Kauffmann, J. E. (2002). Fortress Europe: European Fortifications of World War II. Da Capo Press. ISBN 0-306-81174-X. McRaven, William (1995). Spec Ops: Case Studies in Special Operations Warfare - Theory & Practice. Presidio Press. ISBN 0-89141-544-0. Mrazek, James E. (1991). The Fall of Eben-Emael. Novato, CA: Presidio Press. ISBN 0-89141-406-1. "Eben-Emael: May 10, 1940". After the Battle. 5: 28–39. 1974. ISSN 0306-154X. Saunders, Tim (2005). Fort Eben-Emael 1940. Battleground. Pen and Sword. ISBN 1-84415-255-3.